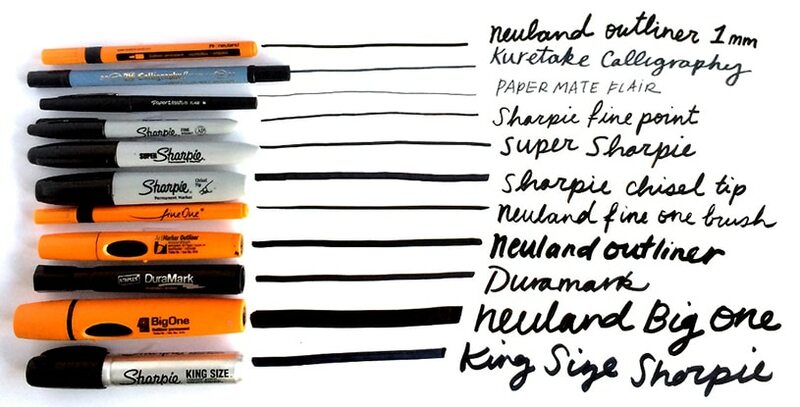 Looking to try your hand at visual note-taking? Starting your first “graphic recording,” as we sometimes call it, can be intimidating. But there are so many reasons to start taking notes visually. Whether you’re a student, a teacher, an executive, or a non-profit manager, everyone can benefit from communicating and sharing ideas more effectively. Think you can’t draw? That’s not what visual note-taking is about. Above anything else, visual note-taking is about listening to content and capturing key points. You don’t have to show off your notes to others just yet. Take the time to practice and your visuals will fall into place. A study found that a group who doodled during a monitoring task recalled 29 percent more information than the non-doodlers (Andrade, 2009). Drawing while listening helps you to stay engaged and remember more information, improves your listening skills, and enhances your ability to organize and connect ideas. 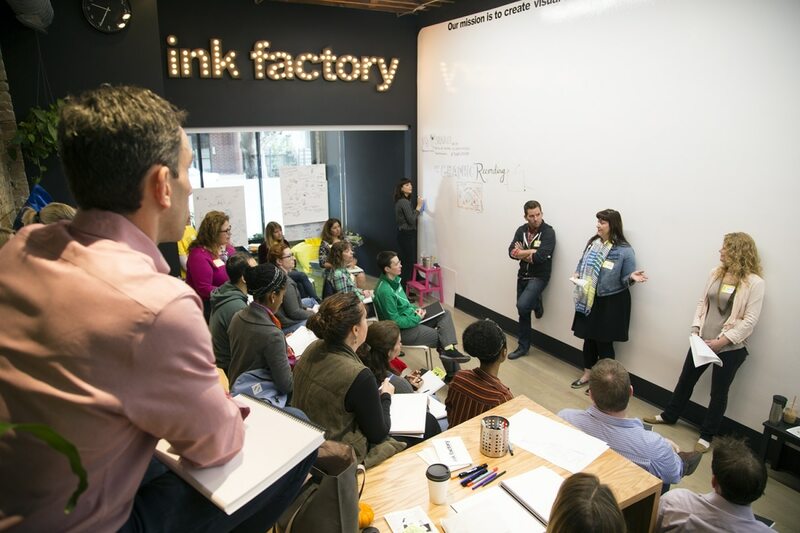 If you’ve seen Ink Factory at work, you know that visual note-taking is the skill of organizing and capturing information through hand drawn images and text in real time. In REAL TIME! Drawing live means you can react to what’s actually being said in the moment, and it means you’ll be more engaged with the key messages behind the content. In this exercise, we’ll walk you through creating your very first visual notes using the Ink Factory approach. At Ink Factory, we draw large scale so we can capture many layers of content. 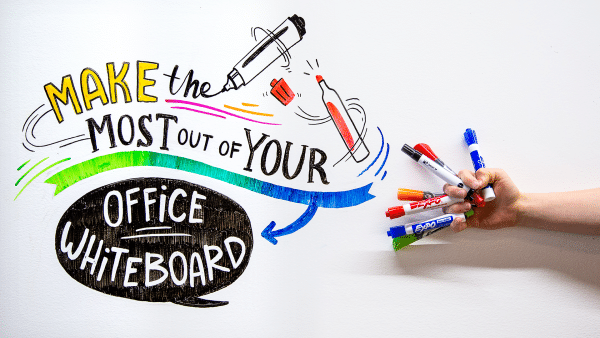 If you feel comfortable drawing large scale– and your office has flip chart paper or a dry erase board–we highly encourage it! However, it’s perfectly ok to use a standard 8.5×11” piece of paper for this exercise. 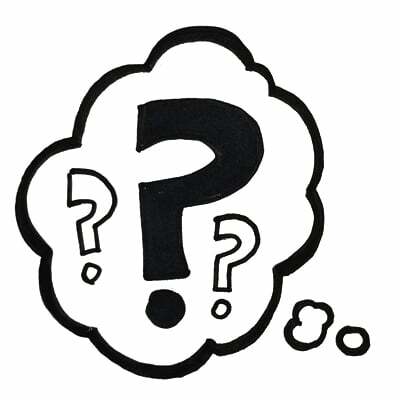 What Are The Best Markers for Graphic Recording? Oh, the Places (and Surfaces) Our Markers Will Go! Next, gather your markers, a pencil, and an eraser. The size of your marker should match the size of your paper. If you’re drawing large scale, use a super sized marker. 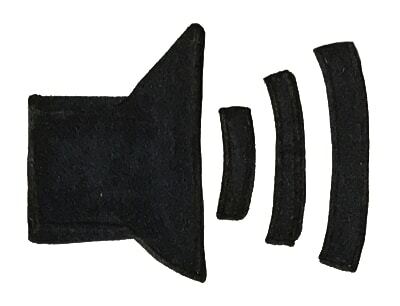 If you’re drawing on regular paper, use a standard sharpie, or even Ink Factory’s favorite Flair pen. If you’re comfortable drawing on an iPad or other tablet, go for it! Next, determine your color palette. Before we start a session, we decide which colors we’ll use in that visual note. 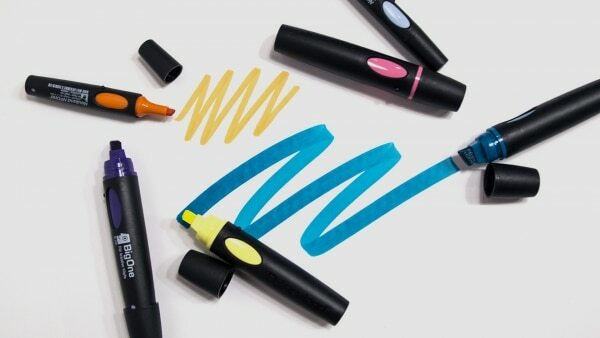 Having a limited number of colors to work with will unify your final image, as well as make it easier to grab markers while you’re drawing on the fly. Lay them out in an organized way so you can easily reach them. For this exercise, in addition to black, select one warm color (orange, red, yellow, pink) and one cool color (blue, purple, teal). It’s also good to have a lighter and a darker color as well. Drawing live is all about timing. A visual note-taker needs to draw at the correct pace, so their canvas doesn’t end up blank at the end, or run out of room with 10 minutes before the end of the talk. With this in mind, have a clock on hand so you can pace yourself. The talk we are providing is just under 16 minutes long. At the 7:30-minute mark, you should have roughly half your paper filled with content. As the clock nears closer to 16 minutes, you’ll know how much time you have left to fill your board. Often before a session or talk starts, we prepare our boards with the title from an event’s agenda. That gives us time to draw the title large and make it look really good! Do the same with this talk. When drawing your title, choosing the size and placement of your title will set the composition for the rest of your drawing. Will you place the title in the middle, across the top, across the bottom? It’s up to you,but your title should be the biggest element on your page. Just like this article’s title is the biggest font on the page, the title should stand out before anything else. No other content you draw after the title should compete with it. If you feel comfortable, you can add a visual to your title, something we call an “anchor image.” The anchor image complements the title and makes sense with the content of the topic being discussed. In the photo above, we’d consider the Chicago skyline the anchor image. 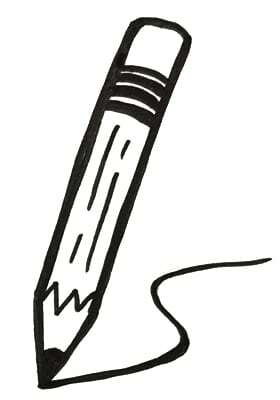 Sketch in your title and anchor image with the pencil, then ink over it with a marker and color it in. Erase the pencil lines. Now you are ready to start drawing live! Your goal is to capture the key takeaways from the talk. Take time to listen before writing. You don’t have to be drawing or writing the entire time. You are the filter for content. 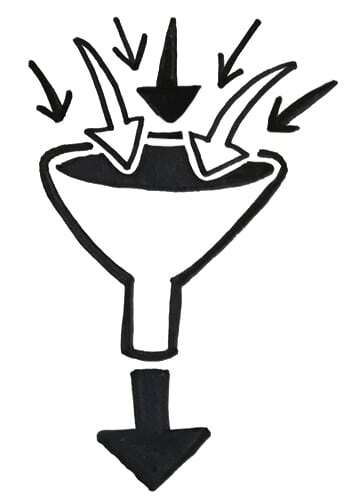 Size of content indicates importance, or hierarchy. If you draw something large, it’s very important. If it’s small, then it’s a supporting detail. Use a larger marker for important points, and a smaller one for details. If you’re not sure if something you’re listening to will be relevant to capture, you can take “pre-notes” by lightly writing in pencil where you might want to draw that point. If you have time to get back to it, draw it in with a marker. Don’t stress over visuals. Letters are visuals in themselves! If a visual comes to you, draw it. If you find yourself racking your brain for something to draw, move on. 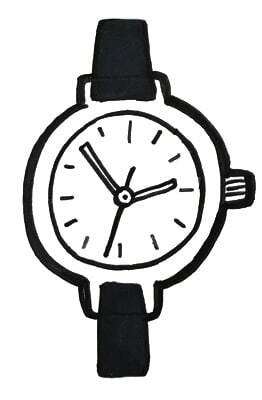 Visuals should be extremely simple and shouldn’t take more than one minute to draw. If your first note ends up with no “visuals,” it doesn’t matter. You still succeed in capturing content! Don’t watch the video while you are drawing. Play the video and then minimize the window so you only hear the audio. Don’t forget to check in with the clock! With pen in hand and paper ready, press play on the video below and start creating your first visual note! Look at what you just created! Great job! But maybe you’re not 100% happy with it. Maybe you didn’t incorporate as many visuals as you wanted, or as much content as you could have. Well you get to do what we wish we could – listen to that talk again. If you want to build on the drawing you’ve already started, you can, or you can start fresh on another page. Are the main points clearly denoted? Did I capture a majority of the key concepts? Did I use color consistently throughout? Did I run out of room on my page, or fill up space too quickly? Does my title stand out from the rest of the notes? Do the visuals I used make sense with the content? 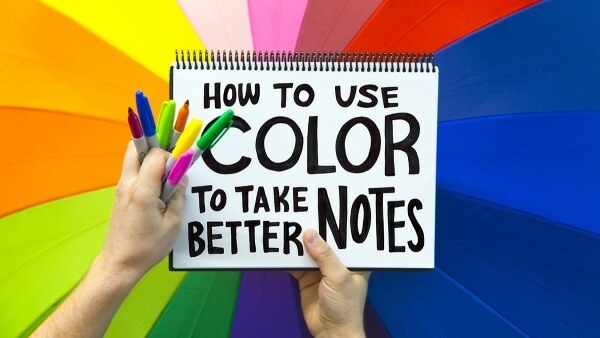 Congratulations – you’re on your way to becoming a pro visual note-taker. Tweet us your first visual notes on Twitter @The_Ink_Factory with the #ThinkLikeInk Hashtag. Correcting mistakes: What Happens When We Mess Up? 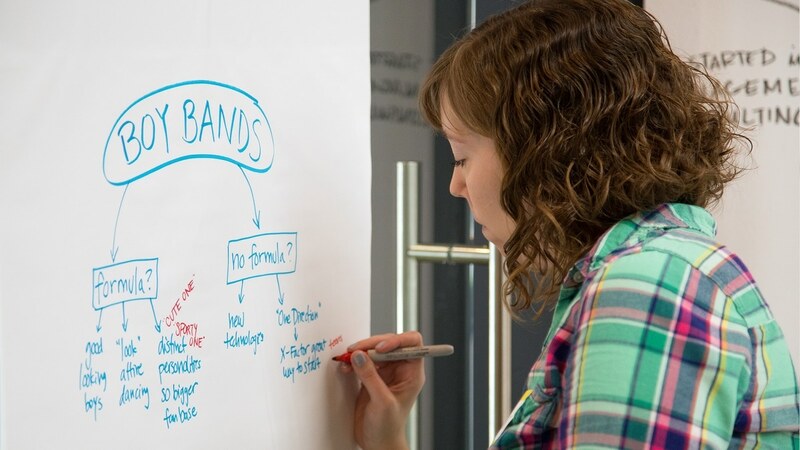 Like any skill, visual note-taking takes time and meaningful practice to develop. Podcasts, keynote speeches on YouTube, and attending conferences and classes are great ways to practice your visual note-taking skills. Want to see Ink Factory work live? We’re sponsoring every talk and conversation at Chicago Ideas Week. Get your tickets here starting September 12, 2017!